Don't you just love it when you find forgotten treasures in your stash?? Treasures that you didn't catalog on Ravelry. I was digging through the stash trying to find skeins of Knit Picks that I had put up for a swap when I discovered three fabulous skeins of yarn. Yes, three. They were mixed up in one of my totes of lower priced stuff (like Patons Classic Merino, Cascade 220, and all Knit Picks...for inquiring minds that wanted to know). 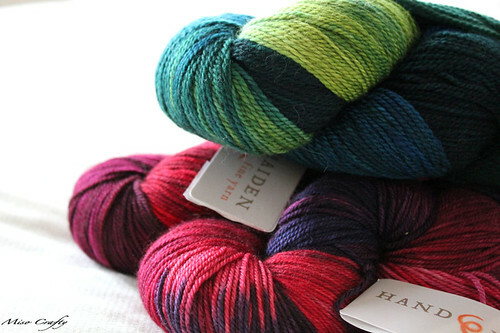 So how in the world did a few skeins of Handmaiden AND Fleece Artist get in there??? I remember buying these yarns too. It was a few years ago during the Beehive's Boxing Day sale. I had bought them after I had woven the Leana Dee scarf, which I had made with Fleece Artist Cashlana. Since that scarf was so well received by the recipient and felt like heaven wrapped around the neck I thought I would pick up some more to weave with. Obviously I never got around to weaving them up. But why didn't I add them to my stash page on Ravelry is beyond me. I guess it really does pay to toss the stash once in a while...you never know what hidden gems you might find!